"Star Wars: Galaxy's Edge," an all-new 14-acre addition to Disneyland Resort this summer and at Walt Disney World Resort in the fall will be the inspiration for a new Marvel Comic book tie-in limited series debuting in April. "For me personally, this is a chance to fulfill a lifelong dream that started back when I was 4 years old watching the opening crawl for the first time at the Astor Plaza in Times Square during the summer of 1977," said Sacks in an announcement. "This new adventure, set in the wondrous – and dangerous – Black Spire Outpost, will have profound consequences for the Star Wars universe, and fans will be excited to see this story span through the eras and bring together some all-time favorite characters, including Han Solo and Chewbacca!" "Black Spire Outpost is a place of endless intrigue and adventure, and what's uniquely exciting about the Star Wars universe is that we are able to bring these stories to life across multiple platforms including comic books, novels, games and the immersive experiences we are building in our theme parks," said Scott Trowbridge, creative executive for the Star Wars portfolio from Walt Disney Imagineering. 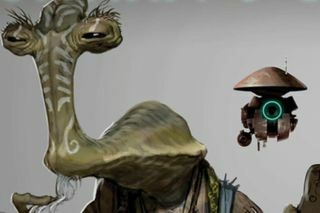 "Working together with Lucasfilm, we are able to integrate back stories, introduce new characters, as well as reveal previously untold stories about fan-favorite characters and their history with the planet Batuu and its colorful inhabitants."